Creativity is defined as the use of the imagination or original ideas, especially in the production of an artistic work. As I look back on my most creative times in life, I realize that the majority of my success is tied directly to the moments that I refused to quit, give up, or allow negative circumstances to affect my mental and emotional state. What five areas truly pique your career interest? What are the 10 things you care most deeply about? When are you at your creative best? By answering these kinds of questions, you will discover why creativity is not “hard work,” but “heart work.” It is human nature to invest more time and effort into the things we are deeply passionate about. So, what are you passionate about? What will bring forth your creativity? I have discovered various “creativity” outlets within my businesses, and they produce profound joy and accomplishment. I am deeply passionate about eLearning and content creation, and as a result, my company has created over 12,000 individual videos and courses that serve a global audience on our eLearning platform called Woople. I am thrilled to say that Woople has served over 650 million minutes of education to students spanning 6 continents. Additionally, I discovered I love to paint! Now, I paint during my downtime, and I truly find my creative juices flowing when I stop and take the time to do that. 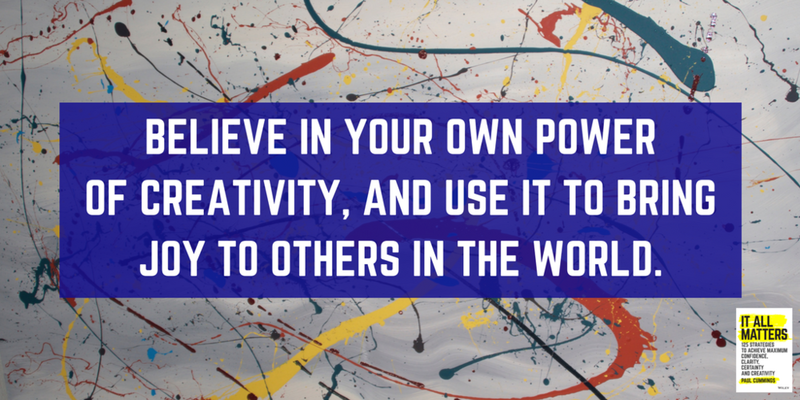 I firmly believe that you too have the power to be immensely creative. All you have to do is make a choice to be more creative. You must believe in your own power to create. What's the most exciting thing about creativity? It has no boundaries at all. One small spark of an idea could literally change your life and your good fortune. One great idea could impact your family, friends, lifestyle, and future. Have you stopped asking great questions? Did you lose your childlike curiosity somewhere along the way? Maybe you have skirted the edges of creativity, and your idea didn’t pan out. The world needs your unique creative abilities, and I want to encourage you to seek them out and share them with the world. Listen to me as I quietly whisper in your ear, “You are creative!” Believe in your own power of creativity, and use it to bring joy to others in the world. Your passion matters, your creativity matters, and you matter. Remember, It All Matters!